Keep your pet's food and water bowls clean. Pets have bacterial microbes in their mouths just as we do, microbes that can be transferred to food and water dishes. A little food left in the dish makes a good environment for bacteria to grow, potentially causing illness for your pet and any (small) human who may play with the dishes. It's recommended to wash the food bowl between meals each day and the water bowl every other day. Store your pet's food safely. If you serve a moist food, refrigerate it promptly or throw away any unused, leftover pet food. Leftover dry food and treats should be stored in a cool, dry place -- under 80 degrees -- in its original bag inside a clean, dedicated plastic container with a lid. Always keep the top of the bag folded close and wash and dry the pet food storage container before refilling with new food. Always wash your hands before and after handling and preparing your pet's food. Though we've always been told to do this for our human food, the same goes with our pets. 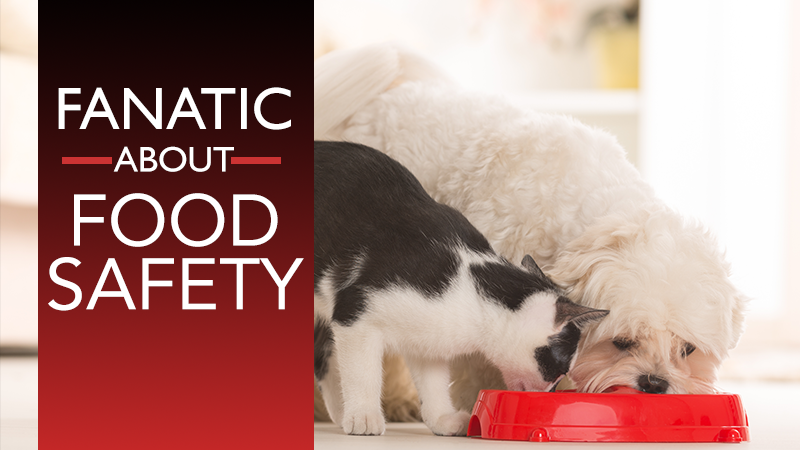 Bacteria and microorganisms such as salmonella can be spread from us to our pets, especially by accident. Wash your hands with warm, soapy water for 20 seconds before and after handling her food, including treats and feeding dishes. Avoid feeding your pet a raw food diet. While many believe raw food is good for pets as it allows them to return to their primal roots, these food items can carry harmful bacteria such as salmonella and campylobacter. These bacteria can be transferred between pets and humans alike. Raw diets include meat, poultry, milk and eggs that have not been cooked or treated to remove illness-causing germs. PG (Propylene Glycol) -- A chemical derivative of antifreeze, PG is commonly found in faux-meat dog treats that resemble bacon or sausage and some dog foods with a moist or crumbly texture. It is banned for use in feline products. BHA (Butylated Hydroxyanisole) and BHT (Butylated Hydroxytoluene) -- These chemical fat preservatives are known carcinogens and have been banned in pet and human foods in Australia, Japan, Romania and Sweden, but are allowed in the United States. Ethoxyquin -- A chemical preservative, ethoxyquin can enter your pet's food or treat as in protein "meals." It is illegal to use in human foods, as data reports state it is harmful when swallowed or has direct contact with skin, but is still allowed in pet food. Food dyes (Blue 2, Red 40, Yellow 5 and 6, 4-MIE) -- These color named dyes have been known to contribute to hypersensitivity reactions, behavioral problems and cancer in humans. 4-MIE is known as a carcinogen in animals. Rendered fat -- Though it provides a flavor enhancement for dry foods, rendered fat is a source of microorganisms and toxins that can flourish if moisture enters the bag. Food safety goes beyond keeping refrigerated only items cool at all times. And though there are a multitude of pet foods and options on the market, we can help you wade through everything and set up a diet for your pet that meets her dietary needs safely and sufficiently and that your furry friend will find tasty and satisfying. Check out our online store for a complete line of food options that we offer, including specialty diets. We even make it easy to get food to your home with FREE SHIPPING! Contact us at 920-458-3636 with any questions about food safety or setting up a personalized diet for your pet.